About two years ago I reviewed the On Stage 40th Anniversary Legacy Edition, which I thought was the ultimate version up till then, at least sound wise and as far as packaging went. With the recent release of On Stage in the classic album series, the Follow That Dream label delivers what must be the ultimate version so far, content wise as well. In addition to the original album, FTD's treatment of On Stage includes RCA's multi-track recordings from three of Elvis' shows. 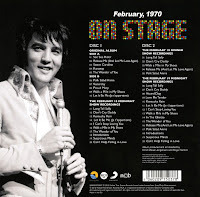 (In total, Elvis producer Felton Jarvis recorded selected songs from nine consecutive shows during February 15-19). No less than 22 of the 28 performances are previously unreleased. It's a real treat getting a seat in the showroom at the International Hotel, courtesy of FTD. 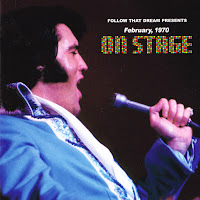 Following the original album on disc 1 are nine recordings from the February 18 midnight show, revealing Elvis to be in a humorous mood. “The squirrels are loose tonight, boy, I tell you for sure, man,” he says before launching himself into a raw performance of “Long Tall Sally,” previously released on the extended CD version of On Stage in 1999. Felton Jarvis must have teared his hair while trying to record a master, listening to Elvis fooling around with the lyrics to “Don't Cry Daddy” and “Kentucky Rain” that night. After getting a good laugh after changing the lines to “Don't cry Charlie, Charlie please don't cry” and singing “together we'll put you on a bummer” Elvis tells the audience, “If you happen to hear that record the laughing is not included, so...” Kentucky Rain gets a similar treatment, Elvis singing “Showed your photograph, to some old gray bearded fools” and “As we drove on through the rain, I realized he's insane.” Hilarious! “Let It Be Me,” on the other hand, shows Elvis in a serious mood, delivering a version very similar to the master recorded the night before. I bet Felton had a hard time deciding which one to include on the album! An outstanding “I Can't Stop Loving You” follows, if possible sounding even better than the one released on the On Stage 1999 edition (also found on disc 2 among the February 19 midnight show recordings). Elvis drops under the radar when he for some reason stops singing in the middle of “Walk A Mile In My Shoes,” missing a line. Maybe he's kissing a girl, as some screaming can be heard, maybe it's something else. Whatever the reason, Elvis gets his revenge singing “The Wonder Of You” which is a beautiful version, again very similar to the master recorded during the dinner show earlier that day. Maybe this explains why it was included on the Elvis 30 #1 Hits album in 2002 instead of the master; simply a mix-up. After introducing a couple of celebrities, among them Fats Domino, and before closing the show with “Can't Help Falling In Love,” the audience is treated with a power version of “Suspicious Minds.” While listening to it I can't help feeling some regret over the fact that no professional footage from this engagement exists. Just imaging watching a performance such as this on the white screen. But I'm thankful we finally have these recordings, as well as those on the second disc, available on CD. He then asks, “What are we going to do … let's do …. something wrong” [laughter] before a male voice in the audience suggests “Are You Lonesome Tonight.” Elvis shoots back, “I forgot that song, good grief,” before delivering a fine rendition of “Don't Cry Daddy,” originally released on the Greatest Hits Volume 1 album in 1981. No fooling around with Charlie Hodge this time! A driven and funky “Walk A Mile In My Shoes” follows, but unfortunately Elvis skips the second verse, a pattern he will repeat while performing the song during the summer engagement in Las Vegas six months later. For some unknown reason Felton Jarvis chooses to fade the ending of the song, before it segues into “In The Ghetto,” and he will do the same on the midnight show that follows a couple of hours later. “Oh, yeah! Play it, Jerry Lee,” Elvis shouts during Glen D. Hardin's intro to “Release Me (And Let Me Love Again),” and then delivers a version that is just as “hard played” as the master on the original album. That goes for the showstopper “Polk Salad Annie” as well, which once again is very similar to the master, although Elvis has some trouble with a cough. But a marvelous performance, nevertheless. The second disc ends with the nearly complete midnight show from February 19, featuring 14 songs. Like the two other shows on this classic album, “All Shook Up” and “I Got A Woman” are missing, the tape starting to roll in the middle of the applause following “I Got A Woman.” Elvis laughs as he strikes a chord on his guitar, kidding, “How do you like it so far?” before we get to listen to the third version of “Long Tall Sally” on the album, as rocking (and short, around 1:10) as the other two. “Don't Cry Daddy” is another song Felton Jarvis recorded during all three shows included on FTD's On Stage release, and it's a serious affair, very much like the one performed on the dinner show the day before. But the seriousness goes out the window when Elvis introduces the next couple of numbers. “I'd like to do a couple of songs that I recorded 35 or 40 years ago [laughter], when I was a baby, man.” After some more clowning around a great version of “Hound Dog” follows, with some incredible drumming by Bob Lanning, done in D.J. Fontana's machine gun style. “Love Me Tender” is a funny version, where Elvis is heard making the rounds and kissing a lot of girls. In fact, there's so much kissing going on that he almost misses the ending. “We were in a dangerous spot there, man, I tell you. We timed that just right, honey, we got the ending in there somewhere, man,” he laughs afterwards. Once again Elvis changes the lyrics to “Kentucky Rain,” using the line “Showed your photograph, to some old gray bearded fools,” so no satisfactory master for Felton Jarvis that time either. But “Let It Be Me” is treated with respect, and was probably a candidate for a master, just like the one done on the midnight show the night before. Then it's time for a couple of versions of songs that were used on the 1999 extended On Stage version. “I Can't Stop Loving You” is followed by the complete “Walk A Mile In My Shoes”/”In The Ghetto” sequence, and why Felton Jarvis recorded them both this time around is anybodies guess. But I'm glad he did. He then pulls out all the stops, turning “Polk Salad Annie” into a five minutes long, ultracool performance - from the spoken introduction to the crescendo chick-a-boom ending. This is truly one of the highlights on this classic album from FTD. After getting his breath back (during which he kisses a lot of girls and introduces his musicians), Elvis again turns on the power and delivers the goods on “Suspicious Minds,” a version known from the extended On Stage 1999 album as well. “Can't Help Falling In Love” then ends yet another fantastic show, and as the tape fades you can clearly hear someone in the audience shouting “Elvi-i-i-i-is!” I feel like doing the same! 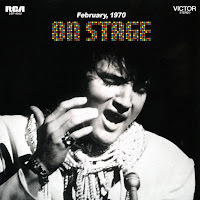 I've always liked the February 1970 recordings, as they show Elvis singing a lot of contemporary material. Not only his new hits but covers from singer/songwriters like Neil Diamond and Tony Joe White as well. So not surprisingly, the On Stage classic album from FTD is a firm favorite already. But I do have some objections. As the booklet points out, the masters of “Release Me,” “See See Rider” and “Polk Salad Annie” used on the original album were also recorded during the February 18 midnight show, so I think they should have been included in their undubbed form among the other tracks from that show. The same line of reasoning goes for “The Wonder Of You” that was recorded during the afternoon show that day. As the first disc clocks at 62:03 and the second at 65:36, they weren't left out due to lack of space (They run for 14 minutes in total). I also miss the rehearsals of “The Wonder Of You,” (available on the legacy edition of On Stage) ”Release Me” and “See See Rider” (both featured on Platinum: A Life In Music and again on FTD's Polk Salad Annie together with one of the three rehearsals of “The Wonder Of You”) that were held in the showroom on February 18 in preparation for the live recordings on February 18 and 19. By my counting, they would've fit onto the two CD's as well, (running for 12 minutes in total). The inclusion of the above mentioned songs would have made the On Stage FTD album more “complete.” It would be nice getting Ernst Jorgensen's comments as to why they were left out, instead of offering two fully packed CD's clocking at 78 minutes each. My final bit of criticism is that the booklet lacks an In And Outtakes section, listing all the concerts recorded, on which albums the released songs can be found, and which songs are still unreleased. But the bottom line is that On Stage is a great release from the Follow That Dream label and Ernst Jorgensen/Roger Semon. Just don't throw away your Legacy Edition or even the 1999 expanded version (including the complete “Yesterday”/“Hey Jude” sequence) if you want to own it all. When I reviewed Promised Land in FTD's classic album series last December, one of my minor complaints was that the unedited master of “Thinking About You” was missing. 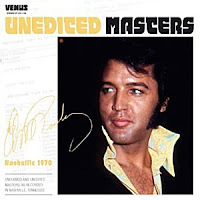 The edited master used on the original album was faded out before Elvis started to sing the chorus, something that became apparent when a longer edit was released on Our Memories Of Elvis Volume 2 in 1979 (as can be heard on FTD's recent Our Memories Of Elvis package). As it turns out, the unedited master was made available on the bootleg CD Unedited Masters – Stax 1973 in 2011 by the Venus label, although in it's original overdubbed form. Running one and a half minutes longer than the version on Our Memories of Elvis Volume 2, it reveals yet another guitar solo after Elvis singing the chorus, and then Elvis having a go at the chorus once again before the song ends. I actually like the idea to present unedited masters this way, as a lot of them were edited prior to their original release. Another example of this is “Love Song Of The Year,” which was shortened by about 30 seconds for release, the longer version available on Unedited Masters – Stax 1973 as well. (but not on on the Promised Land FTD version). 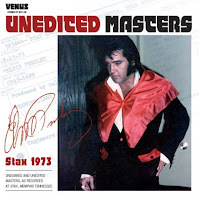 All in all 14 unedited masters from Elvis' 1973 December sessions at Stax are included (together with 11 bonus tracks from Elvis' “Post-Concert Insert Songs Session” after the Aloha From Hawaii Concert), most of them the original overdubbed masters in unedited form. As far as I know it's the first time “Your' Love's Been A Long Time Coming” as well as “Good Time Charlie's Got The Blues” and “Talk About The Good Times” are released with their overdubs without being shortened (the unedited undubbed masters were released on FTD's Promised Land and Good Times, respectively). Another interesting listening experience is the overdubbed version of “My Boy” without the spliced ending, as well as “If You Talk In Your Sleep” with only the backing vocal overdub (the fully overdubbed version with strings and brass is included as well). One of the tracks reveals that Felton Jarvis at times actually dropped some of his overdubs. Evidently “Loving Arms” (originally released on the the album Good Times) had backing vocals overdubbed, but listening to the unedited master I'm thankful they were removed. 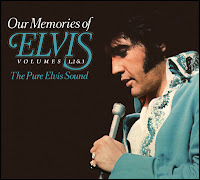 It was nice revisiting the ”Pure Elvis Sound” when the new Our Memories of Elvis FTD package arrived. I've always liked the original volumes since they gave me a chance to hear some of Elvis's 70's material without all the overdubs. This time we are not only treated with the original two volumes (both originally released in 1979), but with an unreleased third volume as well, including several tracks that was mixed but didn't make it onto the final - albeit unreleased - album. The cover is a somewhat modified version of the beautiful volume two cover, which features a shot from the Winter 1970 Las Vegas engagement. Seems RCA (or Colonel Parker) had a lot of those and used them on different releases, such as the Christmas Album of 1971, the Almost In Love LP and Elvis Sings For Children (And Grownups Too!). The original front and back covers of both volumes are included, as well as the cover to an interesting promo version of the second volume, featuring four songs from the album, and with the same four songs in their original released form on side two. In the booklet we get a not extremly informative (and anonymously written) ”foreword”. Foreword to what? However, it's interesting to read that Joan Deary tried to get Felton Jarvis fired and that she didn't approve of the overdubbing of Elvis's 70's productions, but there is no information on how these new versions were accomplished. Several tracks don't sound as they're totally ”pure”, but remixed with the background vocals removed. Or, removed, it's more like they're hidden in the mix but still audible. And for ”I Can Help” I think the overdubbed version was used (that guitar was added later, wasn't it?). The overall sound by the way has improved, but I wouldn't call it great. As I've already stated, it's nice to get to hear more of Elvis's voice, as well as some instruments that were drowned in the original mix. And although I don't approve of the organ in ”Promised Land” which so dominates this ”pure” version, it's interesting to hear it anyway. Several songs are longer than the originals: ”Thinking About You”, ”Don't Think Twice, It's All Right”, ”Moody Blue” and ”When I'm Over You”, to name a few. But with the exception of an alternate ”Are You Sincere”, all the songs are the master versions. I wonder if Joan Deary only had access to these, although in their rough unedited form? Mostly the songs are from 1973 to 1976. Maybe Deary thought the overdubbing got worse as the years went on, and saw her chance to ”correct” these. We can't ask her since she passed away in 1999. And we can't ask the late Felton Jarvis either what he thought of these albums. His attempt to produce ”new” Elvis material came in the form of totally new overdubs on the Guitar Man album of 1981. I remember my brothers - including Thomas - bought the second Our Memories of Elvis back in the early 1980's at a music cassette sale. Thirty years later, I'm glad I picked this set up. Robert Washington, Carl Bradychok and Mary and Ginger Holladay on stage during the opening show in Vara, Sweden. Photo: K-G Melin. Yesterdays opening show in Vara, Sweden, as performed by ‘The Original Elvis Tribute 2012’, is without question the best Elvis tribute show I've ever attended. No doubt this has a lot to do with the fact that it features musicians and singers who once worked with Elvis, such as Bobby Wood on keyboard, bass player Duke Bardwell, backing vocalists Mary and Ginger Holladay, and Jerome 'Stump' Monroe on drums. The sold out show at Vara Konserthus (Vara Concert Hall) kicked off with a couple of classics from the 50's, among them “Heartbreak Hotel,” “All Shook Up” and “Love Me.” From the start it was obvious that the musicians enjoyed themselves. Their smiles, laughs and good humored banter were contagious, and I soon found myself clapping my hands and stomping my feet, just like the rest of the audience. 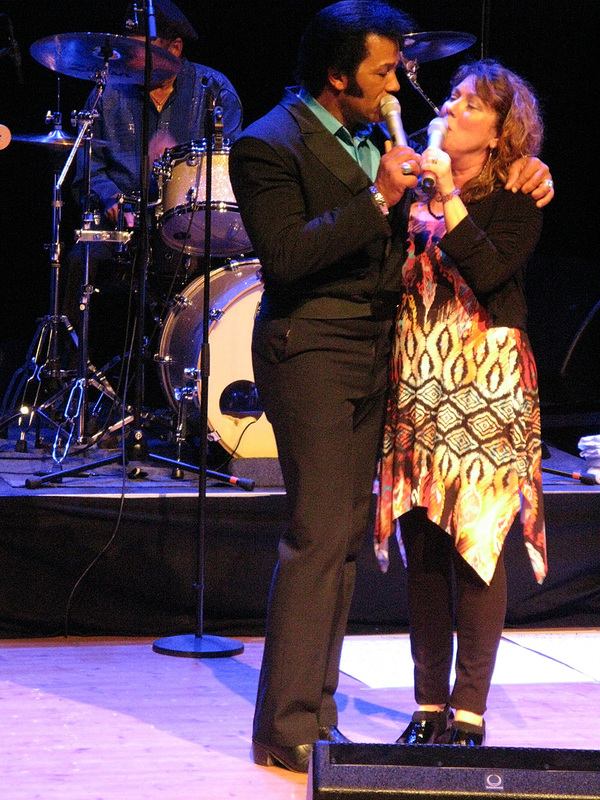 I noticed that Ginger and Mary Holladay seemed to have a really great time on the stage. They added a lot to the show, not only their beautiful voices, but energy and joy as well. One of the highlights was Ginger Holiday telling the audience that she got to sing a duet with Elvis in the studio (“I was 19 and they picked me!”) and then performing that duet, “The First Time Ever I Saw Your Face,” together with Robert Washington. The Holladays singing “Sweet Inspiration” as a tribute to the Sweet Inspirations was a special moment, too. One of the things I like with ‘The Original Elvis Tribute’ concept is the idea to let the original musicians perform songs as well, and Duke Bardwell's version of “Peace In The Valley” was awesome. I'm sure Elvis would've approved. Likewise, it was great listening to Bobby Wood singing “I'f I'm A Fool (For Loing You),” a song he originally recorded in 1964. Before singing it, he told us it was a favorite of Elvis' father Vernon, whom he met during the famous 1969 sessions at the American Sound Studio in Memphis, when Elvis did his version of the song. Another highlight was a driving version of “For The Heart.” What a shame that Elvis never did this one live! And just like Arjan Deelen pointed out in an interview before the show, it was incredible to hear “Suspicious Minds” with the vocal parts sounding exactly like they did when the Holladay Sisters sang them over 40 years ago. No wonder this performance got a standing ovation. The show then ended with two encore songs, “Unchained Melody” followed by “Burning Love.” By this time the audience was on their feet again, wildly clapping their hands. 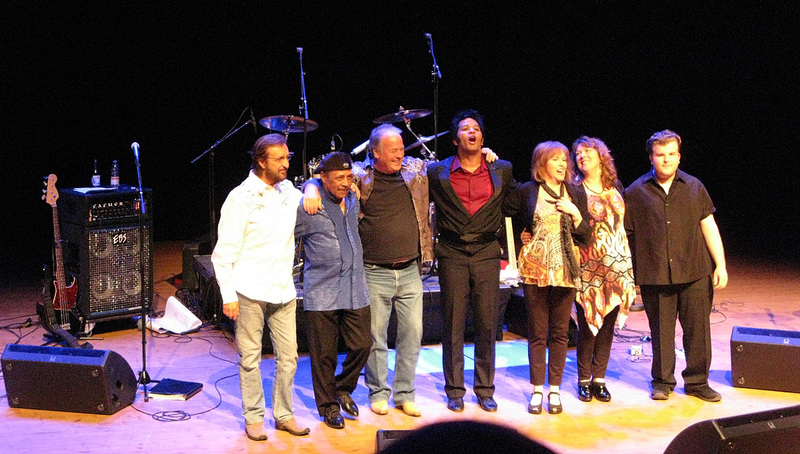 So ended the first show of ‘The Original Elvis Tribute 2012’ tour and I found myself wishing I could catch the rest of them as well. It was that good. PS: Duke Bardwell signed my “T-R-O-U-B-L-E” single during the intermission, and I got Mary and Ginger Holladay's autographs as well. They were really nice to talk to. Mary, Ginger and Bobby together with tour manager Arjan Deelen. 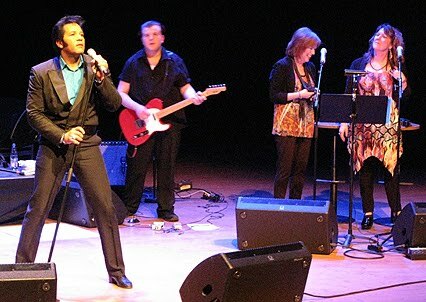 The last couple of days the members of ‘The Original Elvis Tribute 2012’ have been busy rehearsing for the European tour and tonight's (sold out) opening show in Vara, Sweden. 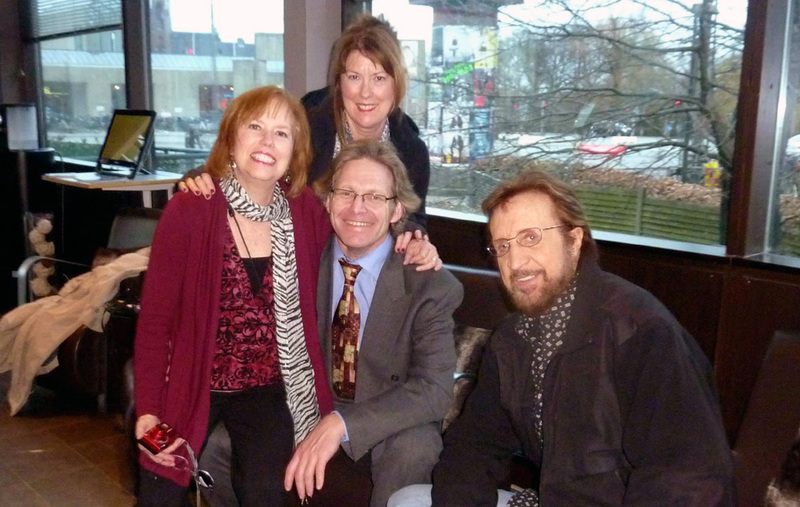 Bobby Wood, Mary & Ginger Holladay, Duke Bardwell, Jerome ‘Stump’ Monroe, Robert Washington and Carl Bradychok all arrived at Copenhagen airport earlier this week, tired after the long flights but very excited about the coming shows in Sweden, Finland, Luxembourg, Norway and Holland. I sent tour manager Ajan Deelen an e-mail and asked him how the rehearsals are going. Arjan Deelen: I think everybody is real pleased with what has been achieved so far. I mean, bringing a band together as diverse as ours and then getting everybody on the same page and putting a show together in a matter of two days is no mean feat. One thing that has definitely worked to our advantage is that the vibes have been great. We have really enjoyed ourselves so far. The new additions to the band are working out just great. The Holladays are wonderful women, very lively and fun to be with and so very talented. They are adding so much to our show. We all all blown away by them. And our new guitarist, Carl Bradychok, who is only 21 years old by the way, is a tremendous player and everybody seems very taken with him. He is adding a lot of youthful energy to the band, and I think everybody is inspired by his playing and by his serious no-nonsense approach to the music. Believe me, the band sounds great! Elvis Today: What kind of show can we expect? Arjan Deelen: As I wrote earlier, it's a very diverse group of people playing together but we all have this one big common factor: our love and respect for Elvis. And that's what makes this show work. Everybody in their own way is committed to paying tribute to him, and you can tell from the great attention to detail and the desire to 'get it right'. We will basically cover the whole spectrum of Elvis' career, from 1955 to 1977. We want to play the music with the freshness and feel that Elvis himself always went after. That's why we tried not to overdo the rehearsals. I don't believe in 'overcooking good food'. Some songs were done only once, and that was really enough - we want to keep things fresh for the live shows. The audiences can expect plenty of rock & roll, but there will also be some ballads and gospel. I am very pleased with the variety and flow of the show. Elvis Today: Can you give us some examples of songs that will be performed? Arjan Deelen: Some of the classics will be there, obviously, because we are playing to mainstream audiences. But we will do them justice. Wait til you hear the sound that the band has on 'Suspicious Minds'. It's just like the original studio master, and not like the later speeded up version. The tone of Carl's guitar on this is just gorgeous, and hearing the Holladays sing their parts again after more than 40 years for me was a near-religious experience. They sound just like they did all these years ago. I had cold chills all over when I heard the vocal parts that we know so well from the records being recreated right in front of me... believe me, that was incredible. 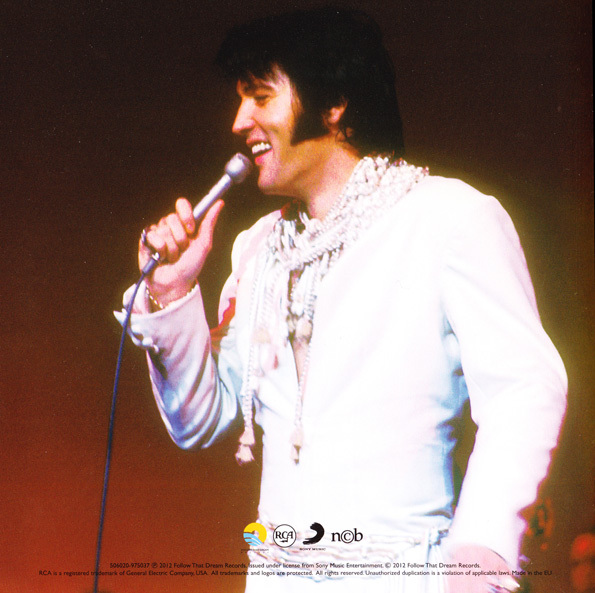 But with the 'Original Elvis Tribute' we also try to take a lot of liberties, and we always include songs that a lot of people don't know about, like 'For The Heart' from 1976. And it sounds just great - it really gives you an idea of how Elvis would have done this one live, with Robert's vocals being so close to the original that it's almost eerie. The band got a great groove going on this one, I think you'll enjoy it. Elvis Today: Any particular song or songs that stands out so far? Arjan Deelen: For me the whole show stands out and I mean that. There are so many highlights, and it almost feels unfair just to name one or two songs. But I want to mention the Holladays singing 'Sweet Inspiration' as a tribute to the Sweets. The Holladays have always felt a special connection with them, and as you probably know, this is a song that comes out of Chip Moman's studios so it just felt right to do it. And with the Sweets' original drummer in the band, Jerome 'Stump' Monroe, it made sense to do this tribute to the Sweets, especially Myrna and Sylvia. And the Holladays sound great on it. I can tell you that Stump was very moved by it. Elvis Today: How do the band members feel about opening in Sweden? Arjan Deelen: We are having such a good time here, and Sweden has always been good for our music. People here are so sincere about their love for the music, and so knowledgeable. I can tell you already now that we will be returning to Sweden in 2013. Several promoters were surprised that we sold out as fast as we did, and we are now negotiating with them. Having read the above answers from Arjan, I can't wait to watch tonight's show in Vara, it really sounds like I'm in for an incredible experience. And of course I'll write all about it in my next post. Stay tuned. Having just finished reading Scotty Moore's autobiography That's Alright, Elvis, my lasting impression is how important Scotty Moore and Bill Black were to Elvis at the start of his career, but how little money the two of them made from Elvis while he earned millions. The book is written by James Dickerson, who spent countless hours with Scotty, as well as interviewing many of his friends and associates. The first three chapters deals with Scotty Moore's childhood (he began to play the guitar at the age of eight), his four years in the Navy (he served in Korea and China) and his time in Memphis (where he put together his first real band, the Starlite Wranglers, recruiting Bill Black on bass) before teaming up with Elvis. And of course it's Scotty Moore's association with Elvis that is the most interesting part of the book, as told in the rest of the chapters (except for the final two that deals with his career after Elvis). According to Scotty, it was he who nagged Sam Philips, owner of Sun records, to give Elvis a call, after hearing Sam's secretary Marion Keisker mentioning Elvis to her boss. Sam finally agreed and gave Elvis' phone number to Scotty. They met on July 4, 1954, and one day later recorded the blues song "That's All Right, Mama," after Elvis started playing it during a break. Bill was sitting on his bass. When Elvis started singing, he leaped to his feet and began playing. Then Scotty joined in. The uptempo tune hit home with Scotty. Fast music was what he liked. For years he had been making up guitar licks for uptempo music, a combination of finger slides and bent-string pauses, but he had found nowhere to put them. It wasn't until Elvis was flailing away at his guitar that he suddenly knew where those licks belonged. The rest is, as they say, history. And Scotty Moore played a big part of that history, especially during the early years, both as Elvis' first guitarist and manager. It's fascinating to read about the life on the road with the Blue Moon Boys, as Scotty Moore shares his memories. "It was a matter of loading up the car, piling in on top of each other, and striking out for the next town." He recalls that food was a constant problem because of the hours they kept, as fast food restaurants had not yet been invented. And he remembers working up several songs recorded by other artists, such as "Tweedle Dee," to fill a fifteen minute show (In the beginning their only hits were "That's All Right, Mama" and "Blue Moon Of Kentucky.") Also, he credits Bill Black with much of their early success. He was a great comedian on stage, taunting and yelling at Elvis and cracking jokes. But despite their vital role in helping create Elvis' success, things didn't turn out so well for Scotty Moore and Bill Black financially. They never got anything on the royalties received from record sales, despite promises from Elvis. And the verbal 50-25-25 split they had in the beginning for performances was removed in the middle of 1955, in favor of weekly paychecks of $200 if they were working and $100 if they were not. Reading the book, I was amazed to learn that Scotty's income from Elvis for the first three and a half years amounted to only about $23,000, plus an additional $4,600 from the movies and the RCA session. In September, 1957, he and Bill Black resigned. A cancelled session to record an album of instrumentals under the name the Continentals together with Elvis on piano (the project was his idea) was the last straw. There was an awkward scene in the studio in which Elvis physically backed away from Scotty and Bill and disappeared behind the protective wall of his entourage. Bill was furious. He slammed his electric bass into its carrying case. Scotty was more disappointed than angry. He just couldn't bring himself to believe that Elvis would treat them that way. For Elvis, it just wasn't the same without Scotty and Bill, and they agreed to come back a little more than a month later. But when Elvis went into the Army in March, 1958, "they were simply let go." Bill Black was so disappointed, he never recorded with Elvis again. Scotty Moore did go back to Elvis in 1960, and attended most of his session right up to 1968. That was also the year that he performed on stage with Elvis for the last time, together with drummer D.J. Fontana during the taping of the television special for NBC. During the rehearsals Elvis asked them if they would be interested in doing an European tour with him. They both said they'd love to. But Scotty never spoke with Elvis again. And although the title of the book, That's Alright, Elvis, refers to the fact that he holds no grudges towards Elvis, it's clear that he was saddened that Elvis didn't come through on certain things, although he never cursed him. "Why should I?" says Scotty at the end of the book. "He was like a brother to me." 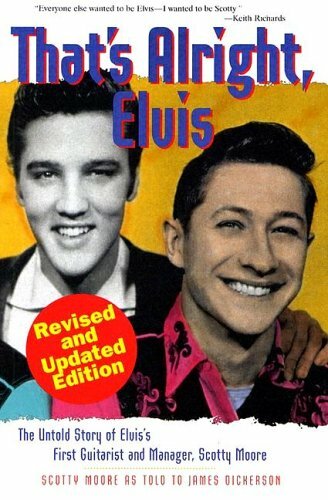 Scotty Moore's book That's Alright Elvis was published in 1997, and in 2005 a revised and updated edition was released. It is now out of print but available as a Kindle Edition from Amazon.